UFC president Dana White has revealed he no longer thinks Conor McGregor has retired from mixed martial arts. White reckons McGregor’s primary goal now is to make as much money as possible, adding: “Listen, who gets respected more than Conor McGregor does? Come on. “The guy’s never been disrespected, definitely not by me. And he’s got a lot of money too. UFC lightweight champion Khabib Nurmagomedov has revealed negotiations over his return to the Octagon are underway and that an announcement for his next fight will be made in the near future. “Yes, we are working on this,” Nurmagomedov told RT Sport. “UFC told me that they are working on this. Former UFC welterweight champion Tyron Woodley admits he didn’t realise the value of the title until he lost it to Kamaru Usman last month. 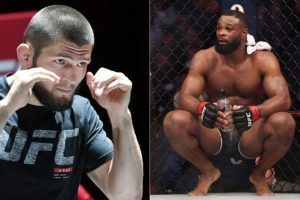 “Sometimes we can try and act like we got it all made and everything’s figured out, but s**t, I told myself I didn’t really worship the belt and I didn’t worship the belt,” Woodley said during an appearance on Ariel Helwani’s MMA Show. “But you don’t recognise until you lose the belt how many things were tied into the belt. “How much opportunities and your platform and exposure, not to mention the amount of money you make and the pay-per-view [earnings].